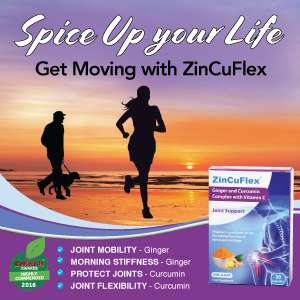 In the ground beneath our feet, out of sight and out of mind, microscopic communities of bacteria, fungi, protozoa and nematodes are working away providing vital functions upon which our very lives depend. The health of our soil, therefore, is key to the health of our plants, our food and, as we are now discovering, exposure to it has many other benefits for our wellbeing. It is likely that our disconnection from the living world is at the root of our present mental health crisis and many of the other challenges we face today. We all know that being in nature makes us feel good, and the health benefits of gardening, working or even just taking a walk on the land are becoming more apparent. Soil is alive; a teaspoon of it can contain billions of bacteria. There is increasing proof that contact with a specific strain of bacterium in the soil, Mycobacterium vaccae, makes us happier and smarter. This triggers the release of serotonin; reducing anxiety and making us feel more positive. Some soil bacterium can also be helpful in preventing or treating diseases. Our future really does depend on healthy soil. With intensive agriculture and an increasing urban population, soil degradation is a serious problem. 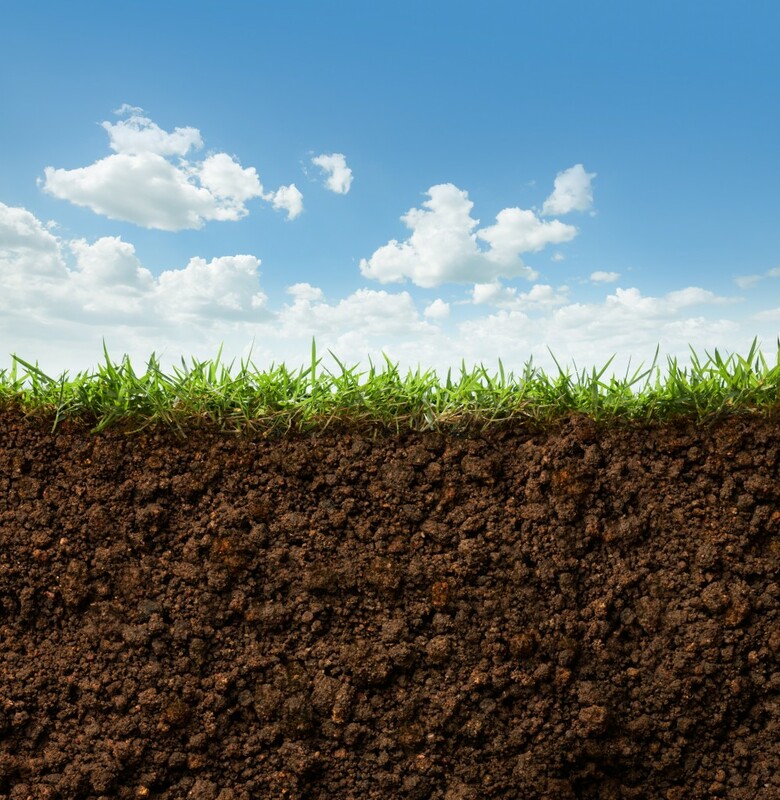 It takes approximately 500 years to replace an inch of topsoil lost to erosion. Half of the planet’s topsoil has disappeared in the last 150 years, and 10 million hectares of productive land is lost annually, the equivalent of 30 football pitches per minute. If we want to counter the damage, we must begin by fostering awareness and nurturing a reconnection to our land. To reverse further degradation of soils we need to accelerate the shift towards more sustainable, regenerative agricultural models and increase participation in the stewardship of our land. Cultivate, the civil society organisation I work with, are the Irish partners in GROW, an EU-funded project setting out to empower citizens to become active guardians of our soil. Commercial organic growers, students, community gardeners and all sorts of growers will use sensors and other equipment to complete experiments and monitor and better understand their soil. They can then share their own data and learn from the results of the wider community. Increased availability of low-cost sensing technologies has opened up all sorts of new possibilities for collaborative data collection and sense making. GROW is a citizen observatory, where people of all ages and backgrounds can help with the monitoring of our soils at an EU-wide level, assisting organisations like the Met Office and policy makers in climate change adaptation and sustainable land use. As well as measuring soil quality, these engaged citizens will develop knowledge and practical skills to regenerate depleted soils. Do you have an allotment or own a small farm? Are you involved in a community or school garden? Do you want to develop your knowledge on soil and skills in growing food? Do you want to be part of a movement preserving soil for future generations? 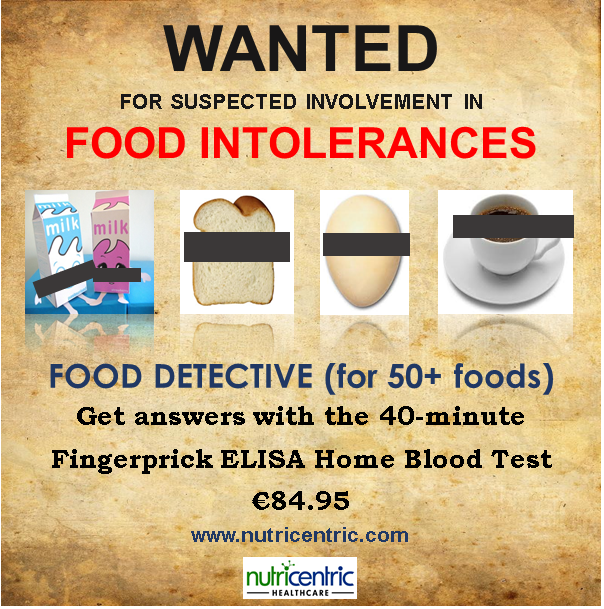 If the answer to any of these questions is yes then email grow@cultivate.ie to get involved. We all know that good hydration is absolutely crucial to our mental and physical wellness. Being just 1-2% dehydrated can reduce our ability to concentrate. It’s no wonder then that water bottles have become increasingly popular as of late. Unfortunately, the vast majority of them are made from plastic and we all know the downsides of that. Thankfully, we now have a solution available in the Irish market called Flaska, a reusable glass water bottle with water structuring technology. Glass is the healthiest material, not only because it does not leach any harmful chemicals like plastic does, but also because it lasts much, much longer, is easier to clean and once you’re done with it, it can easily be recycled with no negative effects on the environment. No more piles of plastic bottles ending up in landfills or in the oceans. Obviously, it’s not only the quantity of water that we drink which is important, but also the quality. We already mentioned that Flaska features a unique technology called water structuring. Flaska’s glass is treated with the TPS procedure, which essentially means it’s imprinted with vibrational energy you would find in natural spring water. This vibration is then transferred into the water poured into Flaska and influences the way the H2O molecules bind together. This process is known as restructuring or revitalising of the water. The bottle comes in a special protective sleeve made from your choice of material from cork to cotton, neoprene to silicon. The sleeves are really stylish. Plastic bottles are so last year. Last summer I had the honour of helping to organise the Earthsong Craft and Creativity camp with the theme of healing through making and doing. This is of course a grand claim, but one in which I believe passionately. I have been carving spoons for a year or two now. It began as an exploration and a way of filling winter evenings. Very quickly, however, I became engaged in the process. As time has passed it has become more of a practice. to manipulate things in a way that no other being can. Well, maybe an octopus. The point is that those thumbs and fingers are linked with the creative, inventive process and it happens at a deep and intuitive level. 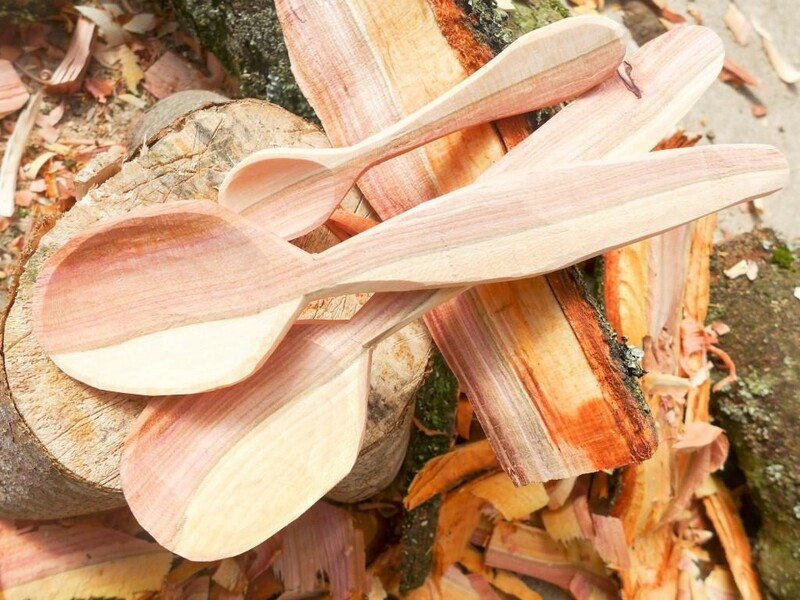 I began teaching others last year with a Spoon Day and then again at the Earthsong Craft Camp. I noticed how engaged people became. I also noticed the value of working in groups. People find it easy to interact with a common task to be performed. It makes connection much more comfortable. I think this is especially true for men. It can be hard to access and feel a part of a community. Making and doing and working together provides a door into a little world. I was lucky as a child. I had a father who made things and fixed things. He taught me a little about using tools and how to do things. Mostly however he left me with the confidence in my own abilities to just get on and do it. Learning to carve and make spoons, then teaching others has been quite a journey for me and one which I didn’t expect when I started out. It is lovely at the end of a workshop when I see people with the things that they have made. I love that they have learned skills and how to use simple tools. Mostly though, I hope they leave with a little bit of the same confidence my father gave to me. On a personal level, the last two years have been a difficult time in lots of ways. Working with my hands making spoons and other things has kept me grounded. Recently, a good friend paid me a lovely compliment. They said I had changed, that I was softer, calmer, more gentle and approachable. I hadn’t seen that in myself and it was nice to hear. When I go out gathering pieces of ash, blackthorn, sycamore and willow left behind by the hedge cutter and sit down to start carving, I will give thanks. Nick Clayson is an architect, craftsman and yurt maker. This is an excerpt from our Autumn 2016 issue. Read more about the amazing work being done by David and Doterra all over the world by subscribing soon so we can post you a copy or picking up a magazine from one of our lovely stockists all over Ireland. Tell them we said hello! 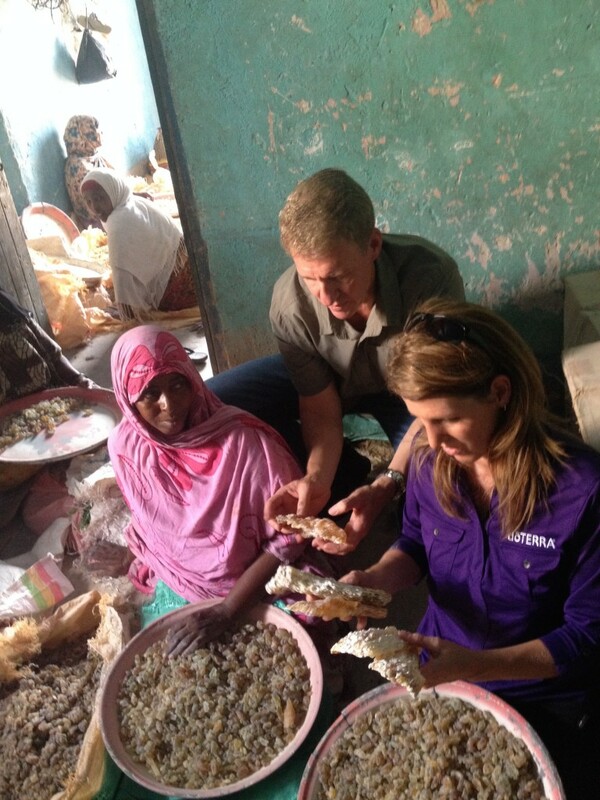 Founded in 2008, doTerra was built on the mission of sharing therapeutic-grade essential oils with the world. Having seen for themselves the incredible benefits that can be had from using these precious resources, a group of health-care and business professionals set out to make this mission a reality. They formed a company and named it doTerra, a Latin derivative meaning “Gift of the Earth.” Each oil provides the living essence of its source botanical, gently distilled from plants that are nurtured and carefully harvested throughout the world. They form a beautiful palette of botanical energies. I spoke to David Stirling, one of the founders and the chief executive officer of doTerra Essential Oils. A humanitarian and a family man, David has been an entrepreneur all his life. When he was around seven or eight years old he started his own little business greasing trikes and wagons. He hasn’t looked back. Innovation is a buzzword that is overused and increasingly misused. If we are to adapt to the challenges we face today we have to nurture a culture of innovation that is about more than developing a new app or just staying ahead of the competition. 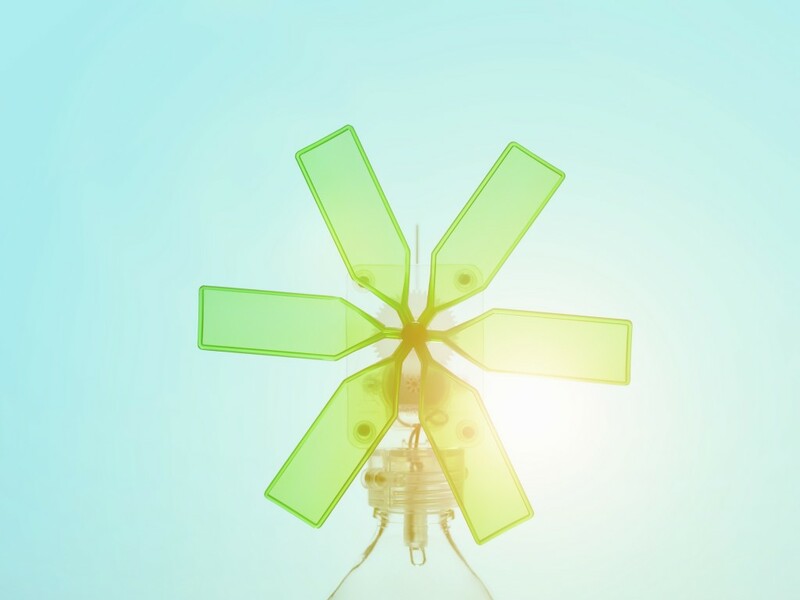 To have real impact in addressing the environmental, social or economic vulnerabilities confronting us, we need an approach to innovation that is collaborative, holistic, and has the potential for transformation. Over the next thirty years, as we make a rapid transition to a low carbon society, we are likely to see more change and disturbance than at any other period in recorded human history. As the business educator Peter Drucker stressed, “the greatest danger in times of turbulence is not the turbulence – it is to act with yesterday’s logic.” In many ways it is our thinking and the way we learn as well as the environments, practices and processes that foster cooperation and creativity, that we have to innovate if we are to be resilient with the capacity to adapt to change. System change and innovation at the scale required needs a mindset change. As George Bernard Shaw said, “progress is impossible without change, and those who cannot change their minds cannot change anything.” Recently Pope Francis has called for a “global ecological conversion”, emphasising that it is not enough for us to go through the motions of change – we need a cultural overhaul and a spiritual revolution. Dr. Otto Scharmer, a senior lecturer at MIT, believes that we need a monumental shift of consciousness, a transition from an outdated “ego-system” way of thinking, focused on self interest, to an “eco-system” awareness that focuses on the wellbeing of the whole. There is incredible untapped energy in our communities waiting to be harnessed. I live in Cloughjordan ecovillage, a sustainability project that is an emerging example of what Scharmer calls, “a living ecosystem of innovation”. With Cultivate I’m based in WeCreate, the ecovillage’s green enterprise centre, which is part of a growing movement of innovation ‘hubs’ that are emerging globally. These physical spaces nurture a culture of mutual support that enable collaboration among different change makers and initiatives. The creative space along with the processes utilised to facilitate collaboration, self-organising and adaptation is what makes these ‘hubs’ really powerful transformational environments. This year our focus at Cultivate is to host events and offer courses that accelerate community-led innovation that will serve society and the planet. Some examples of this include community supported agriculture, community owned energy, car-sharing schemes, co-housing projects, and online platforms to enable peer-to-peer sharing. What is central to these initiatives is that they are citizen-led, and help us develop more resilient, social-ecological systems that allow us and our communities to flourish. From our Spring 2016 issue. Be the first to read the next issue of Positive Life in print –Subscribe. Well I am not only bi-lingual, I am also bi-spudial, meaning I enjoy waxy and floury potatoes. Having left Germany behind in 1985 in the knowledge that I would probably never again eat Sieglinde, the potato I grew up with and Bamberger Hörnchen, the potato I came to love most, one of the first horticultural activities I got involved in in Ireland was growing a field of potatoes with two neighbours. We grew Roosters and Golden Wonder. The Irish government has reported that there has been a 25 percent fall in the amount of potatoes sold in Ireland over the past ten years. And while NASA and the Peru-based International Potato Centre will start cultivating potatoes in Mars-like conditions on Earth, with the hope of eventually building a controlled dome on Mars capable of farming the ancient crop, blue potatoes are now being grown on the roof of JFK airport in New York. Back down to earth Bord Bia, along with the Irish Potato Federation and Irish Farmers’ Association and in conjunction with the Potato Council in the UK, have received EU funding for a three year potato promotion campaign launched officially last October sporting the tagline: “Potatoes: More than a bit on the side.” Potatoes are super healthy vegetables, there is no question: They contain five times less calories than rice or pasta and have twice as much protein as wheat. 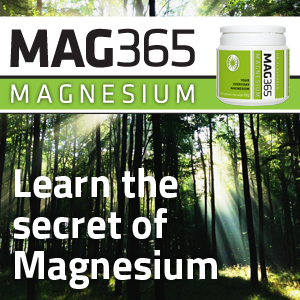 They supply us with important minerals like Magnesium, Iron and Phosphorus and they are higher in Potassium than bananas. Their starch content is very filling, so potatoes can prevent overeating and are highly suited to a healthy and balanced diet. Did you know that floury potatoes are higher in starch than waxy potatoes? to two crops of Earlies in polytunnels. 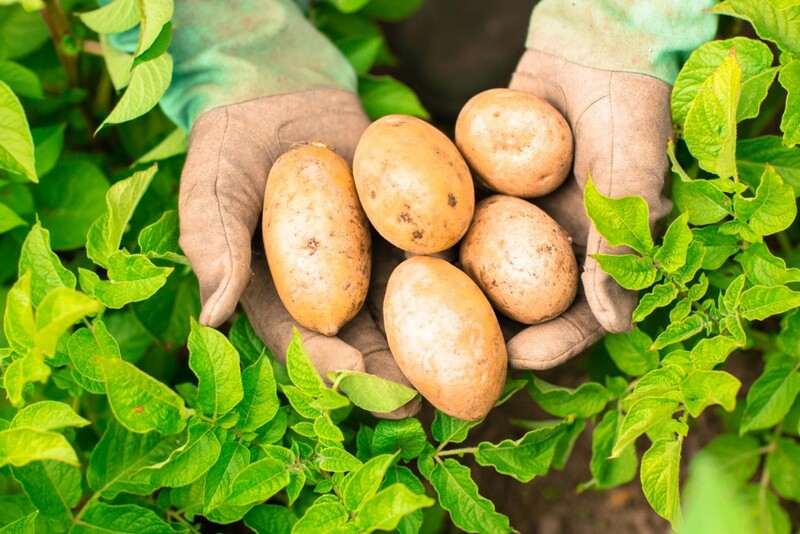 Potatoes are eminently suitable for No-dig gardening! Potatoes are national culinary delights! The Potato is one of the main ingredients in many national signature dishes around the world: Gnocchi in Italy, Tortillas in Spain, Moussaka in Greece, Baked Potatoes in USA, Kartoffelsalat in Germany, Gratin Dauphinoise in France, Roesti in Switzerland, Alu Pakora in India and in Ireland in Stew, Boxty and Colcannon. Wedges are a great secret weapon to get children to eat more big, old-style potatoes. At home we roast them on a really high heat. They cook in the same time it takes to cook frozen oven chips. However, don’t fall for washed baby potatoes! Farmers have to plant twice as much seed potato, and their crop can be rejected if the “skin finish is not right”. It is easy to cook with potatoes every day of the year without using the same recipe twice. They can be combined with nearly all herbs and spices, Nutmeg being the classic, and can accompany meat and fish or be stand alone vegetarian highlights. From our Winter 2015/2016 issue. Be the first to read the next issue of Positive Life in print – Subscribe. We are hardwired to create and share stories; that is how we learn and is what shapes our identity. An authentic and well-told story helps us re-imagine our lives, gives us hope and offers us a sense of what could be possible. If we want to have more influence in shaping a better world, storytelling is a crucial skill to master. A great majority of the stories we are exposed to appeal to values associated with consumption, status and our self-image. Transformational stories need to engage people’s ‘intrinsic’ or non-materialistic values, rather than ‘extrinsic’ or materialistic ones. When the stories we hear appeal to extrinsic values we are far less likely to be concerned about the environment or have empathy for others. Generally what is deemed to be newsworthy, is anxiety-inducing or cultivates self-doubt and apathy. Headlines of crime, terrorism and celebrity scandals dominate, and rarely challenge the economic and social status quo. This narrative of negativity alongside the increasing amount of advertising we’re exposed to keeps us shopping, disconnected and unmotivated to engage in positive change. To meet the targets required to avoid catastrophic global warming we must consume less. Yet the dominant cultural narrative encourages us to do the opposite. However, making people feel guilty about their lifestyle rarely leads to real change and research has shown that ‘threats’ used in communicating environmental or health matters can instead lead to denial and even cause resistance to change. 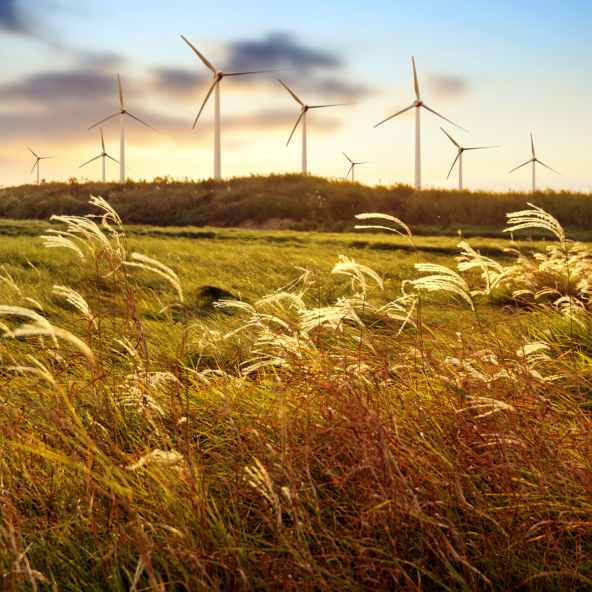 At a recent conference, Mary Robinson demanded that we take the climate change issue personally asking: “What can you do to make the transition to a low-carbon future?” We definitely need to hear more compelling personal stories to inspire us to transform our lives and the places we live. 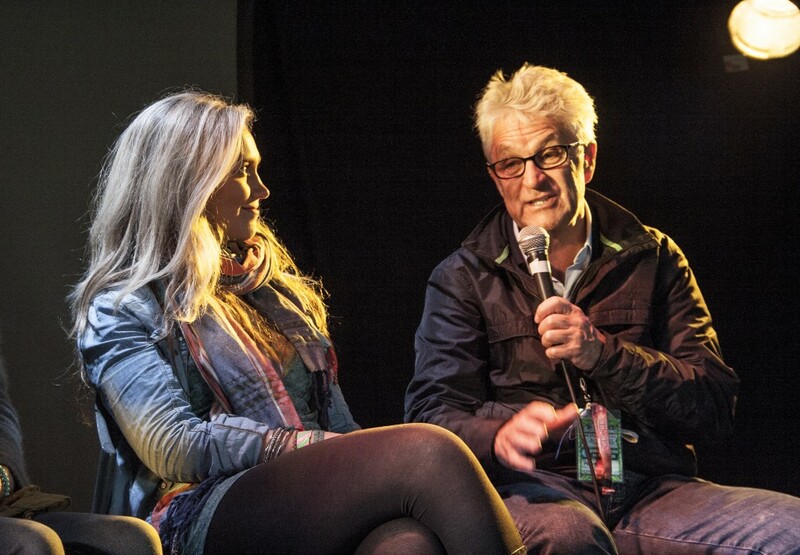 At the Electric Picnic this year, I hosted a panel discussion on the topic of culture change. One of the panelists, a former researcher at a national radio station, remarked that when she pitched stories like these they were deemed ‘too worthy’! Sustainability issues need urgent responses, and although there are many great examples of inspirational, community-led initiatives helping their local areas flourish, are we hearing about enough of them? As someone involved with and aware of many of these initiatives, it’s often a surprise to me how little is known about transition initiatives, eco-villages, permaculture and other grassroots projects that are prototyping a different future. We need communities and individuals that have been successful in developing local energy or food projects, strengthening their resilience or reducing their carbon footprint to share their learnings. We need to hear your stories. Initiatives like Creative Islanders, Change X and Get Involved are all providing platforms that do this and social media makes it easier too, but we can’t just ‘consume’ the stories, we all need get out from behind our screens and live our own part of this unfolding story of change, co-creating a narrative that matters. At a time when regional towns and cities have really struggled, creative projects tackling vacant space have provided an uplifting and refreshing boost for communities and I have been so inspired by the work of Edel Tobin and her collaborators in Waterford. First came New Street Gardens, a crowd-sourced park in the city centre on a derelict piece of land, followed by Waterford Walls, a three day street-art project that flooded the city with colour. Edel, a primary school teacher with no experience in gardening or horticulture simply had a vision to convert a privately owned wasteland into a thriving community park. Its aim was to bring greenery, activities and life back into a disused space. A team of volunteers came together to build the garden in 2014 and although originally planned as a temporary project, it appears it will stay open for the foreseeable future, or until a planned shopping centre is eventually built. The gardens are situated on a piece of land that is part of a collection of sites earmarked for a shopping centre postponed due to the crash. Entire streets were bought to be used in the original scheme. So Edel and her team first had to convince all local stakeholders that this was a project worth having. Apart from Granby Park in Dublin, there were no real examples of people-powered parks in regional towns, but once she had gained enough promises of assistance from local businesses, organisations and the community, support from the council followed. These types of projects capture people’s imagination, build pride in the community and provoke thought and discussion. They challenged the status quo, and shift the conversation within the community and the cultural narrative. Edel was delighted to hear “I can’t believe this is part of our city” on numerous occasions. Waterford Walls brought 24 talented street-artists to Waterford, including some well known artists such as Joe Caslin, DMC, Louis Masai and James Early. Edel teamed up with artist and curator Louise Flynn and together created a small team. 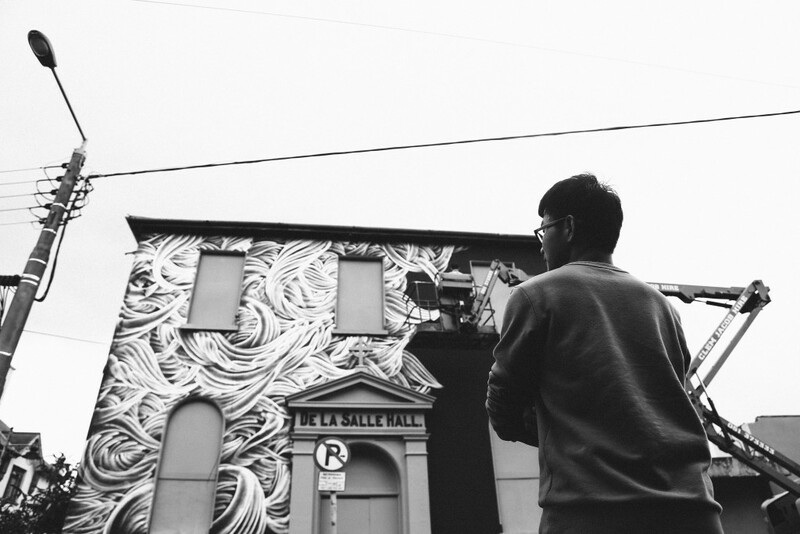 The challenge with getting Waterford Walls off the ground was the lingering perception of graffiti or street-art as a form of anti-social behaviour and vandalism. In the end, this concern turned out to be unfounded as the community completely embraced the event and the artworks. 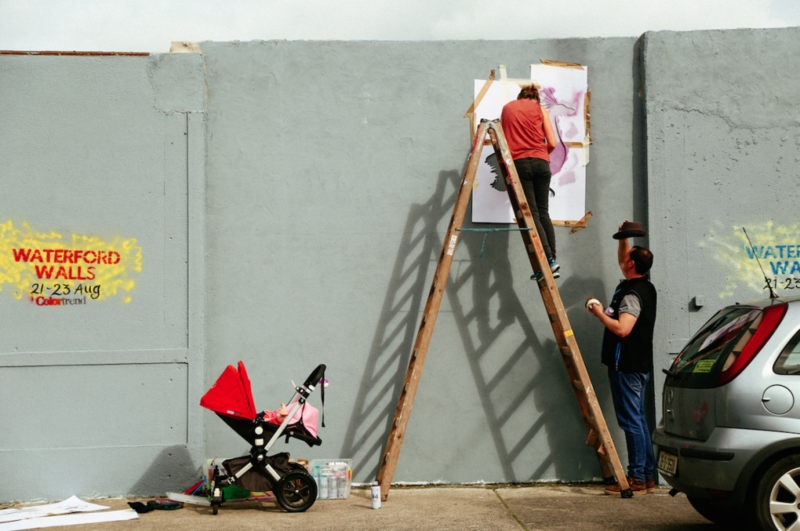 Waterford Walls exceeded expectations with great feedback from businesses, the community and the council and they’ve already begun planning for 2016. Most of the 24 murals still dot the Waterford landscape so Edel urges you to visit them before they fade or get painted over! Edel claims these projects could be replicated in any town or city in Ireland. That’s the beauty of them. Samuel Bishop is coordinator of happenings.ie and streetfeast.ie. Street Feast is the nationwide day of street parties which next takes place on Sunday 12th June 2016. Connect with Sam on Twitter at @Samue1. I spent my summer commoning, practising the forgotten art of co-operation. I am most alive when I am collaborating with others, and I believe change only happens as networks of relationships form between people working together on a common endeavour. As a business model, co-operatives are fundamentally different to conventional profit-driven companies. They are founded on the values of self-help, participation, democracy, equality, equity and solidarity. They are the original social enterprises and more awareness of their benefits may be incredibly beneficial to all of us. Recently I moved back into the Ecovillage, the sustainable neighbourhood in Cloughjordan, which is now home to 130 people, 15 businesses, a communitysupported farm, Ireland’s largest community-owned, renewable-energy heating system and an enterprise centre. The biggest challenge we have is working out how we work together to ensure everyone’s needs are met. Through Cultivate, the co-op that I have worked through since 2000, I co-facilitated a number of events this summer on the topic of community ownership and resilience. These included the Art of Commoning, a three-day summer school that brought people together to discuss the question: What becomes possible when we harness our collective capacity in service of the commons? Following this, we co-curated the Global Green pop-up ecovillage, the sustainability area of the Electric Picnic festival where commoners from 40 community-led initiatives demonstrated the art of commoning to 45,000 revellers. From these events it has become clear to me that a commons and co-operative approach could enable us all to play a greater part in the provision of our food and energy, our housing and many of the services on which we depend. I’m convinced that this could be a powerful force for change that could provide a healthier way of working and living together while driving sustainability. Could the co-operative model play a significant role in the economic recovery of this country by fostering innovation, providing sustainable livelihoods, and contributing to the regeneration of local places? Of course it’s not just the legal structure of the model that holds this promise, but the art of co-operating itself and new community-owned social enterprises are emerging that provide meaningful livelihoods rooted in and benefitting local areas. In Cloughjordan, these include a co-housing co-operative that is developing a shared model for low-cost, low-impact housing and a co-operative food incubator that will add value through shared processing and marketing of what is grown and produced there. But we’re taking it outside the village too. At the end of October, we’ll host a programme of events called a ‘Co-operative Convergence’ across the country. These workshops, fairs, facilitated conversations, and field trips are planned as a way to inspire and progress a co-operative response to the issues facing us all and to involve, educate and engage a broader audience. In particular we’d hope to bring greater awareness to young people and opinion leaders. This is taken from our autumn 2015 issue, out now. Subscribe to have the next four issues delivered in print.